The Apartments specializes in both short stay and long stay serviced apartments in three of London’s premium locations, The City of London, Chelsea and Marylebone. All of our quality serviced apartments are perfectly located as an ideal base for both business trips and London vacations, and are ideally situated within easy reach of the West End, the City of London, Knightsbridge and Chelsea. 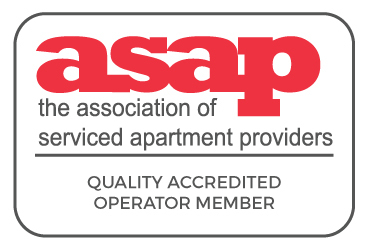 With over sixteen years experience in the serviced apartment industry, we understand that exceptional customer service, quality facilities, privacy, independence and comfort are equally important, whether your stay in Central London is for business or pleasure. All of our apartments include weekly housekeeping services and linen and towels are also provided. They feature contemporary design, fully fitted modern kitchens and bathrooms, with handpicked furnishings throughout (See Serviced Apartments Gallery). Our Long Stay apartments with a 90 night minimum stay, also include many service and apartment upgrades including a complimentary airport transfer, an Abel & Cole organic welcome food box, Nespresso coffee machines, and Nutribullet food blenders. Our guests’ safety is also a priority, and together with fantastic customer service, all our apartments and buildings come fitted with fire alarms, fire safety equipment and emergency lighting. The Marylebone Apartments all also have CCTV in the common areas for additional security. All household utility bills are included in the price. All of our luxury serviced apartments are also situated close to numerous public transport links, making them a perfect base for connecting with, and exploring London’s attractions, museums and shopping, as well as the theatres and restaurants of the West End.